Armelle is a campaign member who has previously reported on cycling in Copenhagen, in Denmark, and Nantes and Bondy in France. Here, she describes her new school run and explains, while there are some things to enjoy, our streets are not designed for cycling families. Having just moved to South Gosforth, we are now enjoying the most stunning cycle ride from home to school, with lots of trees and bird song on the way. I am so happy to no longer have to take Tankerville Terrace to go West Jesmond Primary, where drivers champion the 3-point turn and double yellow line parking. But sadly on our new ride, the infrastructure and environment is still not appropriate for our cycling children. Ilford Road is really not ideal in terms of road surface and gets complicated when parking is allowed on both sides of the road next to the metro station. Not only does it go uphill at this point but there is a lot meandering-through-cars before the bridge, which means a lot of breath holding and hoping your child will react adequately and hoping that drivers will be cautious. Reaching Jesmond Dene Road, we then meet a total conundrum: we can only turn left (so states the writing on the road) but there is no cycle lane and you would have to join the heavy traffic when ACTUALLY we aim for a cycle route on the right. 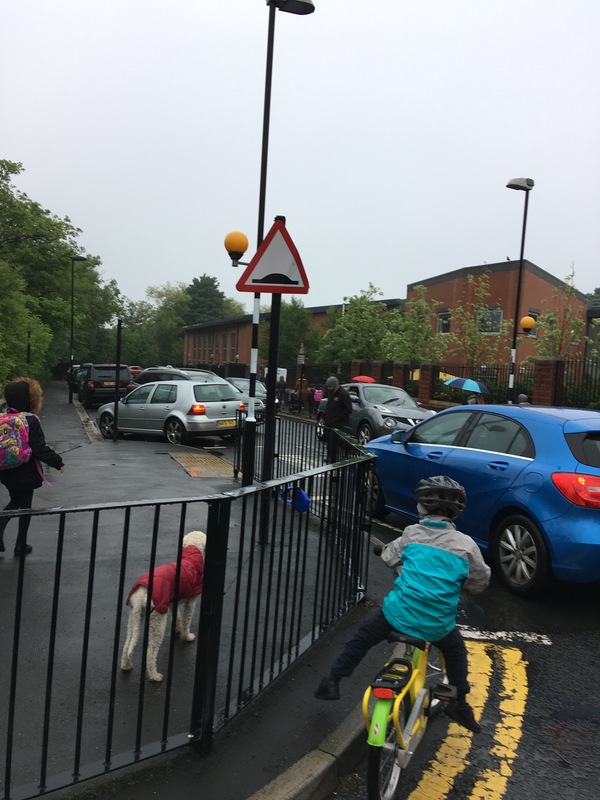 So here I am, having to teach my children to cycle into the path of oncoming traffic to get onto the pavement to get to the new pedestrian and cycle crossing at Little Moor over Jesmond Dene Road. Down Highbury, we recuperate our nerves and enjoy the journey again, the light in the morning has been pure bliss. Crossing Forsyth Road is not easy but so far without unpleasant surprises. We slide down Fairfield very cautiously as I always fear that people driving the other way won’t be expecting a child on a bike. On Fairfield, we meet the 3-point turn champions who I was acquainted with previously. My heart sinks when I get to the school on Brentwood Avenue West. I am the only witness of the average 10 cars parked on the double yellow lines, the pavement is narrow. I try to park my bike on the only post (signaling parking times) to be found. 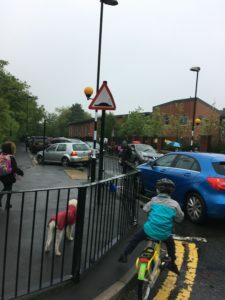 Between my bike and the cars parked partially on the pavement, there is barely any space for the children who’ve been dropped off from the cars to walk the last few metres to school. This is a moment when I feel very lonely and when I feel I expose my children. The whole environment is car-dominated, with only the narrow pavement, not a single bike rack and it feels like there is a series of signs shouting: You should not be here. This is our new arrival at school. I know that it can be be different and I have seen places where children can travel safely and independently to school.